There are 100 Assisted Living Facilities in the Edina area, with 10 in Edina and 90 nearby. The average cost of assisted living in Edina is $2,914 per month. This is lower than the national median of $3,346. Cheaper nearby regions include Richfield with an average starting cost of $2,678. To help you with your search, browse the 410 reviews below for assisted living facilities in Edina. On average, consumers rate assisted living in Edina 4.0 out of 5 stars. Better rated regions include Richfield with an average rating of 4.4 out of 5 stars. Caring.com has helped 9 families in Edina find high-quality senior care. To speak with one of our Family Advisors about assisted living options and costs in Edina, call (855) 863-8283. Just a few minutes from downtown Minneapolis, Edina, Minnesota, supports a population of just over 50,000, with the 55+ group making up about 34 percent of the community. Seniors seeking an assisted living facility have 10 to choose from in Edina, with an additional 48 in neighboring communities, such as Minneapolis, Golden Valley and Minnetonka. These facilities offer services such as housekeeping and laundry, assistance with daily living, medication administration and social activities. The Minnesota Department of Health oversees ALF regulation for Edina and the rest of the state. Edina, Minnesota, has harsh winters that might limit seniors' ability to travel for entertainment, medical care or necessities. The overall Sperling's Comfort Index is 41 out of 100 compared to the national average of 54, and the city receives a healthy 53 inches of snow every year. Temps usually fall between 7 and 84 degrees Fahrenheit. Seniors with respiratory conditions might struggle with Edina's air quality. The city ranks at 28 out of 100 (100 being worst) on the National Air Toxics Assessment, a full 30 percent lower than the national average. Edina, Minnesota, is pricier than the average of 100, sitting at 140.6. Housing is the biggest culprit. These higher rates might mean that Edina is out of the price range for some seniors, who typically have more limited incomes. Edina isn’t the best choice when it comes to providing seniors with tax help. Public and private income is fully taxed. Social Security is partially taxed, as well. Some seniors might qualify for the Age 65 or Older-Disabled subtraction, however, which reduces the amount of taxed income. While no area can guarantee protection completely, Edina is a good choice when it comes to crime. The national average ranks for violent and property crime are 31.1 and 38.1. But Edina does better at 19.4 and 28.8. This is good news for seniors, as the elderly sometimes can be crime targets. Edina is home to world-class medical facilities, including Fairview Southdale Hospital and the University of Minnesota Health Heart Care, in the event of medical emergencies or illness. Assisted Living costs in Edina start around $2,914 per month on average, while the nationwide average cost of assisted living is $4,000 per month, according to the latest figures from Genworth’s Cost of Care Survey. It’s important to note that assisted living rates in Edina and the surrounding suburbs can vary widely based on factors such as location, the level of care needed, apartment size and the types of amenities offered at each community. 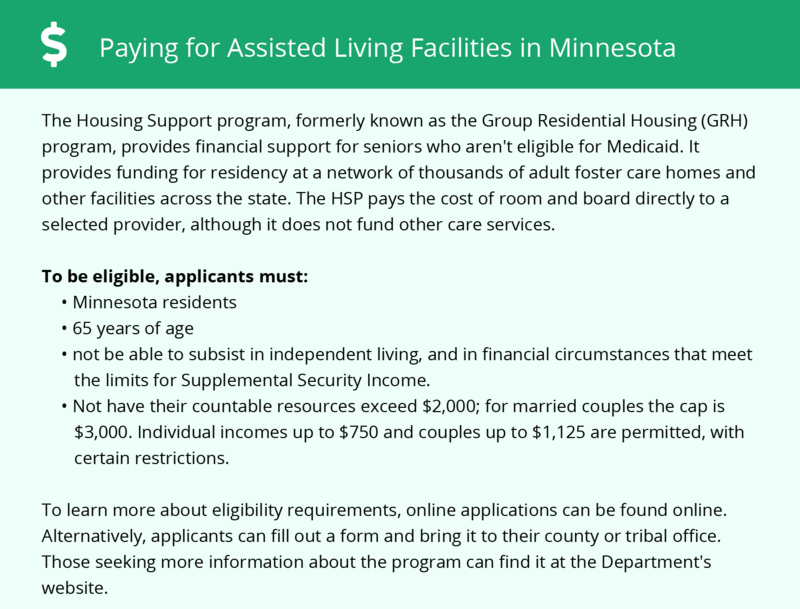 Depending on a senior’s situation, they might be able to get financial help for services in the Edina area through the Elderly Waiver and the Minnesota Group Residential Housing program. Edina and the surrounding area are home to numerous government agencies and non-profit organizations offering help for seniors searching for or currently residing in an assisted living community. These organizations can also provide assistance in a number of other eldercare services such as geriatric care management, elder law advice, estate planning, finding home care and health and wellness programs. To see a list of free assisted living resources in Edina, please visit our Assisted Living in Minnesota page. Edina-area assisted living communities must adhere to the comprehensive set of state laws and regulations that all assisted living communities in Minnesota are required to follow. 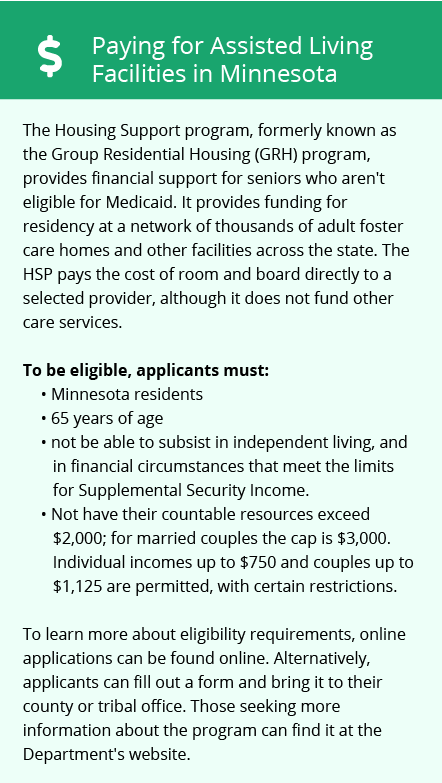 Visit our Assisted Living in Minnesota page for more information about these laws.